This is an at-your-pace learning system comprised of almost 200 pages of information. Learn detailed information about posture, how it's controlled by the body and how it's affected by external sources. Review all the latest research concerning both adult and youth posture. This might be the most detailed collection of posture information ever. Also learn the latest detection AND correction methods. The purpose of the material is to establish a standard in the analysis and treatment of Forward Head Posture in anticipation of school districts across the U.S. adding FHP to scoliosis exams and then needing a referral source. All material was assembled by Dr. Joe Ventura, one of the leading Posture Experts. Which Came First Head or Hip? Posture Certification requires a successful completion of the posture course and a live review of your posture analysis technique by Dr. Ventura. 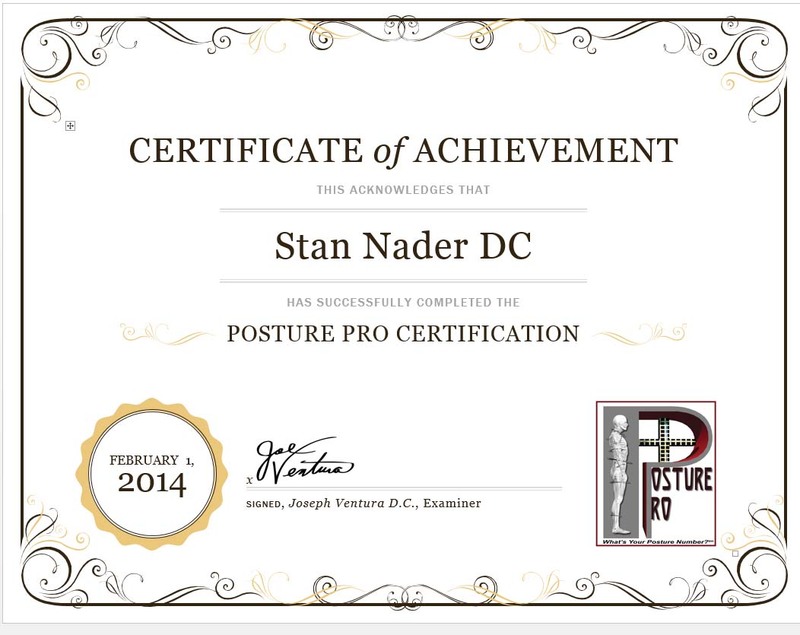 Your certificate also places your business in our international database of Posture Professionals.